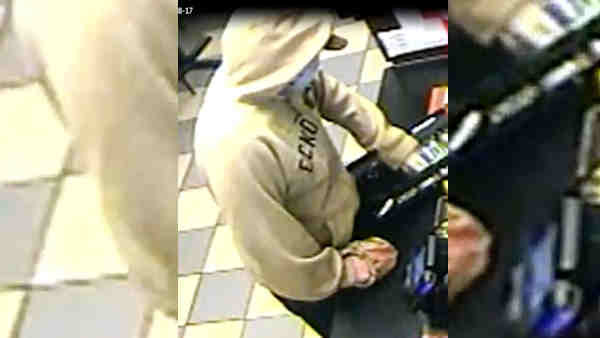 JAMAICA, Queens (WABC) -- Police are looking for a man in connection with robbing Queens Dunkin' Donut shops. According to the New York City Police Department, the suspect hit the same store in less than two weeks. Around noon April 4, police said the suspect approached an employee at the 219-11 Hillside Ave. store, and ordered a donut. He then passed the employee a note demanding money. The suspect reached over the counter and took money from the register before fleeing with about $300. Around midnight April 14, at the Dunkin Donuts at 202-09 Hillside Ave., the suspect approached an employee, ordered food then demanded money from the cash register. Police said the suspect took about $150, then fled. The same day, several minutes later, police said the same store that was robbed April 4 was hit again. The suspect approached an employee, ordered a donut then demanded money from the cash register. The employee refused and the male fled empty-handed. The individual is described as a white man, 20 to 25 years old, 5 feet 10 inches to 5 feet 11 inches, 190 pounds, and last seen wearing a light colored hooded sweater, dark colored pants and a blue surgical mask over his face.